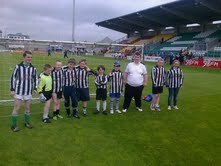 Our Football for All kids that attended the Football for All day last Sunday the 23rd of September in Tallaght Stadium. The football for all scheme started in Cahir Park in September 2011 and is aimed at children with disabilities from the age's of 6 yrs to 16 yrs. At the moment we have 14 children in our group and we meet every Saturday in Cahir Park at 1 pm.